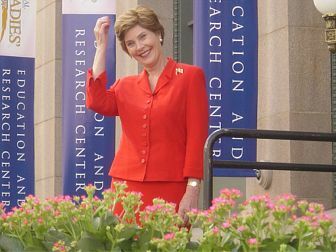 Canton, OH – September 4, 2003 – Laura Bush will inaugurate today a historic addition to American culture, the National First Ladies’ Library Education and Research Center, in an official ribbon-cutting and dedication ceremony in downtown Canton. The only resource of its kind, the Center offers on-site access to the most comprehensive collection of rare artifacts and personal writings from the 43 former First Ladies. In addition, the Center provides K-12 educational programs, curricular enrichment materials, and a constantly expanding electronic bibliography of more than 50,000 entries, making articles, manuscripts and publications about the most influential women in history available to students, educators and scholars alike from any Internet accessible personal computer. The Education and Research Center marks a significant expansion of the National First Ladies’ Library, which was established in 1995, located one block away on Market Street in Canton. “We are thrilled that the Mrs. Bush will inaugurate this National Resource Center dedicated to the women who occupied the ultimate front-row seat on history being made – while making history themselves,” said Mary A. Regula, president and founding chair of the National First Ladies’ Library. “All of the living First Ladies have been most helpful adding to our archival collections and writings. They are our honorary active chairpersons,” she said. The Library and its Education and Research Center was born as a result of Mrs. Regula’s personal frustration when she tried to gather information about Mary Todd Lincoln, only to discover a lack of resources about one of the most well-known First Ladies. Mrs. Regula founded the National First Ladies’ Library in 1995. ”I began to lecture on Mrs. Lincoln at numerous organizations, clubs, and history classes. It was then that I began to look into general books on the First Ladies. I was a bit shocked at the dearth of information available – there were no scholarly or definitive biographies of any first ladies – not even Abigail Adams or Eleanor Roosevelt. Still, I continued to search for more information on these remarkable women, often discovering whole new aspects of their lives that were both intriguing and remarkable. I wondered why so many people still knew nothing about the contributions they had made to our history? Now, with this state-of-the-art research facility and library, and a beautifully restored Victorian museum, someone searching for a role model, researching a speech, or defending a maligned First Lady has a place to come to document the truth. This will become a home for scholars, school children, authors and armchair historians alike to finally fill the void in American history,” said Regula. The Education and Research Center offers a host of new and innovative programs and services to educate people of all ages about the little known but very significant contributions of First Ladies and other notable women throughout American history -- we have honored women who were first or pioneers in their respective fields. In addition to containing more than 3,000 books on, by, or about former first ladies and their contemporaries, the Education and Research Center contains an archive of more than 3,500 First Lady photos, artifacts, and other items, readily available to scholars and members of the public for research or simple enjoyment. “This project is really about creating a living library for future generations that will serve as a tool for learning and exploring the historic contributions of influential American women. Our main goal is education, education, education and education at all levels to make history come alive,” said Regula. Children are a natural audience for the Education and Research Center’s outreach. The Education Department at Kent State University, under the direction of professors Bette Brooks and Dr. Averil McClelland, has partnered with the Library in developing several original curriculum research guides for K-12 students, along with teacher workshops to accompany the material. The units incorporate hands-on activities, comprehensive texts, and online resources to emphasize the remarkable contributions of First Ladies during the most influential periods of U.S. history. Elementary and middle school materials were piloted in the fall of 2000 and 2001 at approximately 35 schools, and a high school curriculum is scheduled for testing this fall at 10 area schools. Completed units meet Ohio Curricular Standards and are currently available to students and teachers. As individual curriculum is developed for each of the First Ladies, it will be produced for use on a national scale, in compliance with National Education Standards. In addition to offering educational resources, the Center will also host different community activities and events to engage the public in learning about the First Ladies. Events include theater productions, documentaries on First Ladies, lectures by First Lady authors, old newsreel showings, and conferences focused on the presence and influence of First Ladies. The Library will move into the electronic world by teleconferencing with students and classrooms throughout the country. The web site, www.firstladies.org, will provide a comprehensive look at events and activities as they are planned and scheduled, as well as resources and exhibits. The 7-story, 20,000-square foot Education and Research Center was donated to the National First Ladies’ Library in 1997 by the Marsh B. Belden, Sr., Family, and has since undergone $7.5 million in renovations, equipment and electronics. Built in 1895, it was formerly the City National Bank, and much of the interior has been preserved. It is located one block from the Saxton McKinley House, family home of Ida Saxton McKinley. Both the House, which is a National Historic Site, and the Education and Research are operated by the National First Ladies’ Library.